Concrete is one of the most important and widely used pieces of a landscape like patios, driveways, walkways, steps, and planter dividers. We offer a variety of concrete options to our customers, depending on the customer, landscape, and what the customer is trying to achieve. 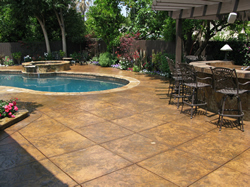 We offer regular concrete, custom stamped concrete, colored concrete by SCHOFIELD, PIP concrete caps. Decorative finishes include Stamped, Wet saw cutting, score lines, acid wash, exposed aggregate, sandblasting, salt rock finish. 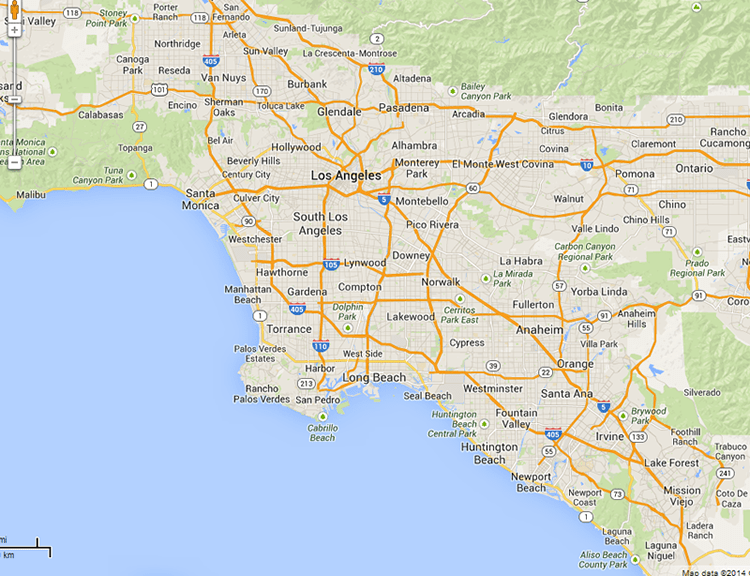 We only use the best concrete companies, such as STANDARD. Our quality standards are as follows: a minimum strength of 2500-5000 PSI, we utilize expansion felt, fiberglass fibers, and #4 rebar spaced 18″ to 24″ depending on the city code. At Dreamwork, quality is everything. From the East Asia Stone quarries to your patio, DreamWork delivers it all, we have custom stone and bricklayers with 20+ years experience. We can custom make a stone patio, cover a wall with EL DORADO cultured stone, build a seat wall with PACIFIC CLAY brick, or lay a beautiful mega begerac pathway by BELGARD pavers. With our exclusive designs and pattern combinations we deliver a powerful piece of artwork. Having the best professional designers makes a difference every time and providing the best quality material from the biggest names gives our customers confidence and satisfaction that DreamWork is the right choice. Most every landscape project has or needs some type of wall or pilaster. 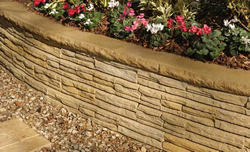 We offer customers built re-tainting walls, block walls, seat walls, planter walls, and different types of block and decorative items, such as cultured stone, brick, concrete caps, and stucco to make them that much more appealing. The construction of a wall is very important; that is why we are up to date on the latest building codes, and practice quality control measures when it comes to constructing a wall. We custom build all aspects of walls, and make them aesthetically pleasing. Pilasters give your landscape a little something extra, built to your specification, pilasters can be decorative, using various colors of block or covered with a stone veneer, brick, stucco or tile, finished with a concrete, brick or stone cap. Adding a decorative pilaster gives your landscape a great look. We offer custom built barbecue islands built to suit your needs, from the basic rectangular design to the more extensive, larger Islands with built-in plumbing, flat panel TV, refrigerators, lighting, custom granite tops, and much more. We also offer specially designed fire pits and fireplaces to expand your entertaining area, and give your yard that extra bonus. Fire pits and fireplaces give you the opportunity to extend your living area, adding a warm, cozy place to relax and have fun, built to your specifications. We offer custom patio covers, decks, fences, and gates. At Dreamwork the sky is the limit. 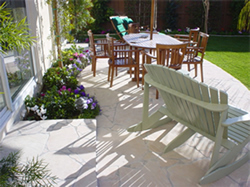 Trex decking systems are also available. We offer an array of different types of wood, pine, red wood, Douglas fir, and much more, custom built to your specification, with decorative molding finishes. We also offer repair and replacement of major supporting beams and posts. Custom built with excellent craftsmanship, your project will last for years to come. 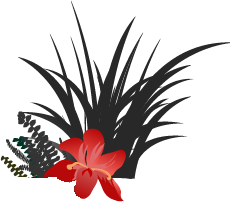 We offer several options to clients who would like to incorporate a water feature into their landscape. Water features provide tranquility, peace of mind, and relaxation. 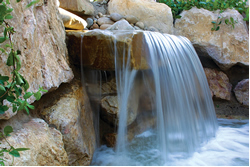 We offer pre-casted and custom-built ponds, waterfalls, and fountains.